Acapulco international airport (ACA), in Guerrero state, currently handles about 800,000 passenger movements each year. The airport is operated by Grupo Aeroportuario del Centro-Norte (GACN), which also manages airports in another 12 cities. With suitable fanfare in 2014, GACN announced plans to replace the terminal building. Acapulco, Mexico’s first major resort. Photograph by Tony Burton. All rights reserved. Last month, GACN reiterated it is investing $30.5 million to build a new terminal building for Acapulco capable of handling 1.3 million passengers a year. The group claims that the new terminal, which will be more than 18,000 square meters in area, will have a state-of-the-art design that will reduce the risks associated with natural hazards and provide much greater space for passengers, airlines and all other supporting services. In addition, it will adopt a range of electricity-saving measures, lowering the airport’s regular operating costs. 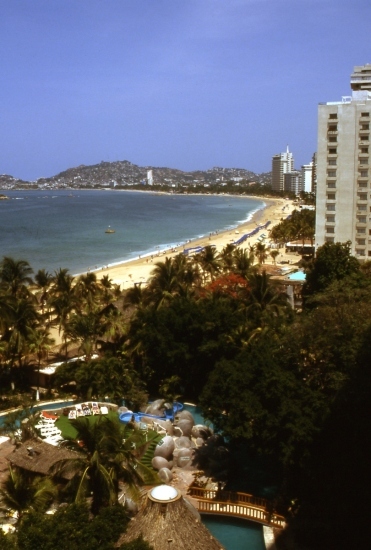 Now scheduled to be completed by mid-2018, the Acapulco terminal is the most significant single investment that GACN plans to make in the next five years, and comes at a time when city authorities are busy revitalizing the famous resort. An improved public transit system known as Acabús was officially inaugurated in the city in June 2016. The new terminal will, however, no longer be ready in time for 2017, when Acapulco will once again host Mexico’s massive annual tourism trade fair, the Tianguis Turístico.